The above conclusions are confirmed by an increasing body of studies carried out on cultured cells, model animals and humans . These studies provide compelling evidence that plant polyphenols, including olive polyphenols, are potential candidates for prevention and therapy of a number of diseases and pathological conditions, particularly cancer and several aging-associated degenerative diseases  . The following section summarizes recent studies on olive polyphenols providing support to this view. OLE and HT were shown to reduce angiogenesis via downregulation of cyclooxygenase-2 (COX-2) expression, prostanoid production and matrix metallopeptidase 9 (MMP-9) protein release, together with reduction of intracellular ROS levels and NFκB activation . Polyphenol-stimulated apoptosis has been reported to proceed (i) via caspase activation involving pro-apoptotic Bcl-2 family members and PI3K/AKT signaling in pancreatic cancer and hepatoma cells [51,56] and (ii) through the dose-dependent cytoplasmic increase of the c-Jun-N-terminal kinase (cJNK), p53, p21, Bax and cytochrome c in HeLa and cervix carcinoma cells . The activation of the p53 or the G protein-coupled estrogen receptor 1/30 (GPER1/GPR30) pathway [53,59], or the inhibition of the anti-apoptotic and pro-proliferation protein NFκB and cyclin D1, its main oncogenic target, in breast cancer cells  has also been shown. Olive phenols seem to be particularly effective in breast cancer cell models. In these cells, HT was shown to induce cell cycle arrest in the G0/G1 phase by a decrease in the cyclin D1 level  and OLE apparently prevents cancer metastasis by increasing the tissue inhibitors of metalloproteinases (TIMPs) and by suppressing the MMP gene expression . OLE has also been reported to inhibit aromatase, a cytochrome P450 family enzyme proposed as an important pharmacological target for breast cancer treatment , and to induce a complete recovery of sensitivity to trastuzumab (>1000-fold increase) in SKBR3/Tzb100 cells, a model of acquired resistance. The latter effect provides one of the first examples of how selected nutrients provided by an EVOO-enriched MD (particularly OLE aglycone) affect positively Human epidermal growth factor receptor (HER2)-driven breast cancer . OLE is able to reduce cell proliferation through inhibition of fatty acid synthase (FAS) gene expression in certain colorectal cancer cells  and in prostate cancer cells. The latter effect results from reduced cell viability and the induction of both thiol group modifications, of reactive oxygen species (ROS) as well as of the expression of γ-glutamylcysteine synthetase, pAkt and heme oxygenase-1 . OLE has also been reported to disrupt actin filaments with ensuing disassembly of cytoskeleton in different cell lines  and to shut down, in MDCK cells, epithelial–mesenchymal differentiation, a key process in the progression toward organ failure and metastasis of organ fibrosis and cancer . A recent review has summarized data concerning the anti-cancer activity of olive polyphenols reported in literature, proposing that the effect of EVOO secoiridoids is related to the activation of gene signatures associated with protection against cell aging and stress, including ER stress and the unfolded protein response, Sirt1 and Nrf2 signaling . Moreover, EVOO polyphenols activate AMPK, promote apoptosis in cancer cells and suppress several genes related to the Warburg effect and to cancer stem cell renewal. Finally, EVOO polyphenols prevent age-related changes in cell size, heterogeneity, arrangement and staining of human fibroblasts for β-galactosidase, associated with cell senescence, at the end of their proliferative life period . As such, EVOO polyphenols can be considered a new family of plant-produced gerosuppressants that molecularly “repair” the AMPK/mTOR-driven path, leading to prevention against aging and age-related diseases, including cancer . In conclusion, the data presently available support the idea that OLE and other olive polyphenols hold promise as potential chemotherapeutic agents for treatment of malignant mesothelioma, breast, pancreatic, prostate cancer and other types of tumors. Nevertheless, these potential beneficial effects need full confirmation in animal models and extensive investigation in human subjects before they can be proposed as new possible anti-cancer agents. Cardiovascular endothelium is a main target of all major risk factors for heart disease (hypertension, hyperglycemia, hyperlipidemia, inflammation, aging), and its damage is one of the first steps in the development of CVD. Cardiomyopathy can also be caused by a number of drugs, including the antineoplastic antibiotic doxorubicin . The key feature shared by the CVD risk factors is increased ROS; in turn, ROS production by endothelium mitochondria contributes significantly to heart disease [71,72]. Olive polyphenols (OLE, HT, oleacein, elenolic acid and thyrosol) display important beneficial properties against atherosclerosis  and CVD (reviewed in ) (Table 3). Finally, at nutraceutical doses, OLE was reported to protect against doxorubicin-induced cardiomyopathy in rat models by positive modulation of oxidative stress markers , AMPK activation and iNOS suppression . The strong antioxidant properties of these substances, particularly HT and OLE , could explain, at least in part, these effects. In fact, OLE, HT and tyrosol are able to reduce the kinetics and the extent of lipid peroxidation  and protect against ischemia/reperfusion-induced oxidative stress provided to isolated rat hearts at doses corresponding to the average intake in a normal MD . Moreover, OLE has been reported to reduce the extent of infarcted tissue, total cholesterol and triglyceride levels in both normal and hypercholesterolemic rabbits, thus providing cardioprotection even before the ischemic event . Taken together, these data warrant further studies to provide convincing support of the future use of olive polyphenols, or some derivatives, as cardioprotective agents. Olive oil, and particularly its oil polar lipid extract, have been shown to be antiatherogenic by reducing the level of platelet-activating factor, thus reducing platelet aggregation . OLE appears to possess the highest anti-atherosclerotic power among all olive polyphenols, mostly resulting from cholesterol regulation. In particular, EVOO polyphenols have been shown to enhance the expression of genes related to cholesterol efflux from cells to HDL in humans  and also to promote the HDL-dependent cholesterol efflux by increasing HDL size, stability and resistance against oxidation . The anti-atherosclerotic effects of OLE in atherosclerotic rabbits has also been reported to imply a reduction of serum levels of total cholesterol, LDL, HDL, triglycerides, NFκB, and several chemokines . In this sense, a potent anti-atherosclerotic power was also reported for thyrosol through activation of a molecular pathway starting with protein kinase B (PKB)/AKT phosphorylation, Sirt1 expression and deactivation of the transcription factor FOXO3, which upregulates pro-apoptotic genes and eNOS . These data were confirmed by subsequent studies showing that olive oil polyphenols downregulate pro-atherogenic genes in healthy humans in the context of a traditional MD  and positively modulate post-prandial vascular function (arterial stiffness) and the inflammatory status (interleukin-8, IL8, production), two factors of CVD risk in vivo . The latter effects were elicited by repressing the expression of several pro-inflammatory genes, including those encoding the cytokines IL-6 and IL-8 , possibly through their redox activity. It must be noted that IL-8, and other pro-inflammatory cytokines, have been proposed to play an important role in the development of atherosclerosis , and its circulating levels have been associated with future risk of CVD . Finally, cardioprotection by olive polyphenols has been supported by studies showing their ability to enhance fat oxidation and to optimize cardiac energy metabolism in high-fat-diet rats as well as to improve myocardial oxidative stress in standard-fed rats . Over the course of the last decade, in addition to the already quoted effects on the classical risk factors for CVD, several scientists have studied the beneficial effects of olive oil and olive leaf extracts on thrombosis-associated factors (primary and secondary hemostasis, platelet aggregation, fibrinolysis), a pathophysiological condition closely related to CVD [91,92]. Finally, pre-treatment with OLE and oleacein of endothelial progenitor cells that produce neovascularization of ischemic tissue and de novo formation of endothelium in injured arterial walls, increased cell survival and reduced senescent cells and intracellular ROS production, possibly following activation of the Nrf2/heme oxygenase pathway . Overall, these and other data support the notion that olive phenolics can be beneficial for cardiovascular health, suggesting their importance to lower the risk of CVD. 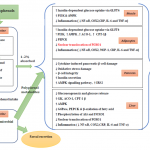 EVOO polyphenols display a multifaceted activity against metabolic disorders (Table 4). Obesity, an increasingly widespread condition affecting millions of people mainly in developed countries, is also associated, among others, with increased risk of CVD. Several olive leaf components, including OLE, HT and others have been shown to be effective against obesity by suppressing dose-dependently intracellular triglyceride accumulation and the expression of adipogenesis-stimulating factors during adipocyte differentiation [94,95,96]. Other studies have reported that olive polyphenols can be effective in reducing food intake and fat tissue accumulation by regulating the expression of molecules involved in adipocyte proliferation and thermogenesis at the mitochondrial level . Finally, it must be reminded that most of these effects are shared with other plant polyphenols such as resveratrol, epigallocathechin and curcumin. The latter have been reported to reduce body weight, fat mass and triglycerides by lowering adipocyte viability and preadipocyte proliferation (i) by suppressing adipocyte differentiation and triglyceride accumulation; (ii) by stimulating lipolysis and fatty acid oxidation and (iii) by reducing obesity-associated inflammation . Diabetes, notably type 2 diabetes (T2DM), is a condition closely associated with obesity and CVD and these states concur with the so-called metabolic syndrome; the latter also includes non-alcoholic fatty liver disease (NAFLD), a condition whose severity spans from simple triglyceride accumulation in the liver parenchyma (steatosis) to non-alcoholic steatohepatitis (NASH). 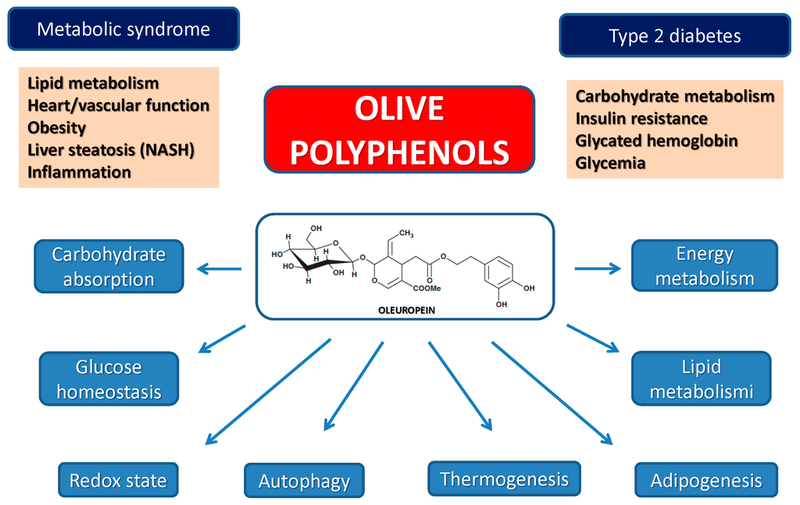 T2DM and other pathological states associated with deregulation of carbohydrate and lipid metabolism can be positively targeted by olive oil polyphenols. The positive outcome of the administration of OLE and other olive polyphenols against derangement of carbohydrate metabolism is supported by many studies. The latest reports have highlighted that the molecular determinants of these effects are interwoven with those associated with the reduction of obesity and liver steatosis as well as with cardioprotection. The reported anti-diabetic effects comprise: (i) the inhibition of the amylin tendency to aggregate into amyloid, whose toxic deposits in the pancreatic β-cells are considered to affect cell viability in T2DM ; (ii) the reduction of serum glucose and cholesterol levels with restoration of the antioxidant perturbations in rat [100,101] and rabbit  models of diabetes; (iii) the modification of the expression of genes implicated, among others, in lipogenesis, thermogenesis and insulin resistance in high-fat-diet mice ; (iv) the reduction of the digestion and intestinal absorption of dietary carbohydrates both in the mucosal and in serosal sides of the intestine of diabetic rats , together with the improvement of glucose homeostasis with a reduction of glycated hemoglobin and fasting plasma insulin levels in humans [103,104]; (v) a significant rise in insulin sensitivity and pancreatic β-cell secretory capacity in middle-aged overweight men  with a measurable and rapid change of the expression of genes mechanistically related to insulin sensitivity and to the metabolic syndrome ; (vi) the reduction of the metabolic activity, cardioprotection and prevention of inflammation and of cytokine-induced oxidative damage of pancreatic β-cells [98,106]; (vii) the improvement of the antioxidant status in healthy elderly people  and the protection of insulin-secreting β-cells against H2O2 toxicity by modulating redox homeostasis with protection of cell physiology against oxidative stress ; (viii) the prevention of the inflammatory response and of cytokine-mediated oxidative cell damage with downregulation of the genes involved in adipocyte differentiation ; (ix) the downregulation of Wnt10b inhibitory genes and upregulation of β-catenin protein expression as well as of key adipogenic and thermogenic genes in high-fat-diet mice [95,109] as well as of genes involved in galanin-mediated signaling; (x) the upregulation of genes involved in Wnt10b-signaling in C57BL/6N mice  and (xi) the increase of signal molecules active in fasting conditions (IL-6, Insulin-like growth factor-binding protein 1 and 2, IGFBP-1 and IGFBP-2), yet in the absence of significant effects on interleukin-8, TNF-α, CRP, lipid profile, liver function ambulatory blood pressure and thickness of carotid wall layers . 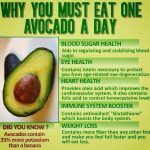 Finally, two recent studies have reported that (i) the anti-oxidant and anti-inflammatory properties of the polyphenols in olive leaf extracts attenuate the metabolic, structural and functional modifications in the heart and liver of rats with diet-induced metabolic syndrome  and (ii) the administration of an OLE-enriched supplement to the Tsumura, Suzuki obese diabetes (TSOD) mouse model of T2DM reduced hyperglycemia and impaired glucose tolerance and, less evidently, oxidative stress, when the administration was extended in the long term. In this study, OLE supplementation was ineffective in reducing obesity . In other cases, the anti-obesity and anti-steatosis effects of olive polyphenols have been associated with increased lipid metabolism and energy expenditure as well as with the modulation of glucose homeostasis mentioned above . Olive polyphenols display significant protection against liver disease resulting from altered lipid metabolism. In particular, OLE protects HepG2 and FL83B cells against free fatty acid (FFA)-induced hepatocellular steatosis via reduction of FFA-induced lipogenesis following lowered extracellular-regulated kinase (ERK) activation, reduced expression of genes involved in adipocyte differentiation, and Wnt10b inhibition in hepatocytes . OLE also appears to protect against oxidative stress-mediated liver damage by increasing the expression of genes involved in liver lipogenesis, oxidative stress and inflammatory response  as well as by reversing, in visceral adipose tissue, the downregulation of thermogenic genes involved in uncoupled respiration and mitochondrial biogenesis induced by a high fat diet . Moreover, olive polyphenols have been reported to downregulate lipid synthesis in primary cultured rat hepatocytes through AMPK phosphorylation, suggesting that a decrease in hepatic lipid metabolism, particularly lipid synthesis, may represent a possible mechanism underlying the reported hypolipidemic effect of these substances [115,116]. Olive oil and polyphenols, notably OLE, also prevent NAFLD (reviewed in ) and its progression to NASH and liver fibrosis in mouse models of NASH, presumably through anti-oxidant activity and reduced lipid accumulation, supporting their potential pharmacological use in NASH prevention and care [118,119,120]. Finally, other studies carried out in animal models and with cultured cells have shown that one of the mechanisms of cell protection by OLE is the aforementioned potent stimulus to autophagy. Presently, autophagy stimulation is considered an important potential goal in the research of effective therapies against neurodegenerative and dysmetabolic pathologies such as T2DM.